From the streets of his native San Francisco to the steps of Rome to one step away from God performing for the Pope, Aki Starr is an internationally acclaimed pop singer, songwriter and producer. He is also an accomplished actor and model making him a 5-star threat. Starr has a pulse for what is happening in popular culture and music with his chart-climbing Billboard singles. His songs are played on the radio, in clubs and in hot spots from New York to Sao Paulo, Brazil. Starr’s songs reign on top 10 dance, club and EDM (electronic dance music) charts making him one of the most relevant singers today. His current hit “The Closer I Get to You” has been featured in iTunes as “New and Noteworthy” with its high-energy dance mix and dubstep beat. It has also been featured on MTV’s “Sways Universe” as a top music video and praised by industry music veterans and dozens of music blogs and magazines. Starr’s musical accomplishments have taken him from the dance floor to the homes of millions, writing hits for popular TV shows “Knock First”, “Jake 2.0″, “Malcolm in the Middle”, “Desperate Housewives” and others. Every generation has an artist that represents them whether it be “The King” Elvis Presley, “King of Hearts” Frank Sinatra or “King of Pop” Michael Jackson. Starr is an artist that also transcends time with his soulful voice and ability to continuously create and lead pop music trends. Starr has performed with world-class musicians including Malo and Jorge Santana. During the height of the Freestyle musical era, he was a singer with the Warner Bros group Spanish Fly. The group’s hits included “Daddy’s Home”, singles included “Treasure Of My Heart”, “Crimson and Clover”, “Visions”, “I Can See”, “One Last Try” & “Who You Loving Tonight?” As a result of Spanish Fly’s contributions to the Freestyle Era, San Jose, California was not only known as the tech capitol of the world, but the Freestyle capitol of the West Coast. Additionally, Starr was a member of the world renowned Renegade Rockers break dance crew known for his explosive and athletic performances to sell out crowds. Starr is electric on stage. He is a master at connecting with the audience and brings them into the world of music, moving them beyond the beat to absorb every note of the song. 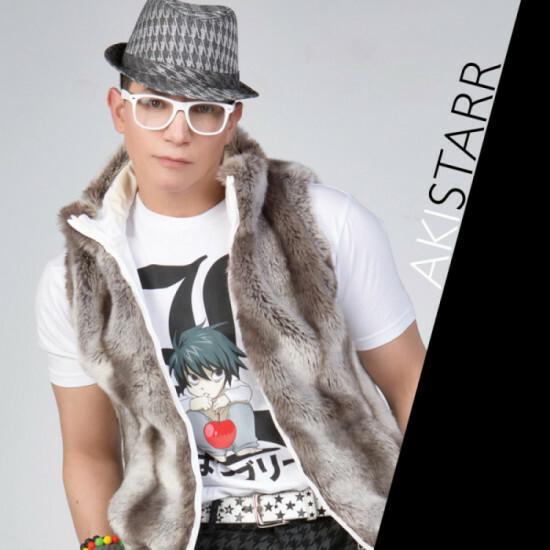 His global tour is underway so get your dancing shoes ready, because Aki Starr will rock you unlike any live performer today. This is what the industry is saying about Starr.